Restaurants : Blue Agave Oyster & Chile Bar, Blue Agave Steakhouse, Baja Beach Cafe, Festival Buffet, Garunos and a food court. Hotel amenities : Luggage service, maid service, valet parking, wake-up call, smoke shop. Fiesta Rancho, a.k.a. the "Royal Flush Capital of the World," offers hot gaming action, award-winning dining at a great price, comfortable accommodations and terrific service, all in an intimate environment. 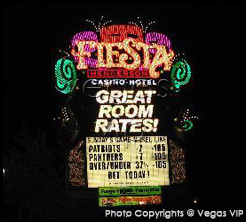 Located minutes from the Las Vegas Strip and downtown, the Fiesta offers a friendly, local-oriented atmosphere along with the same high quality that distinguishes Strip resorts. The Fiesta Rancho offers many well-known dining options including the BLUE AGAVE STEAKHOUSE which servers traditional American steak, seafood and chops. 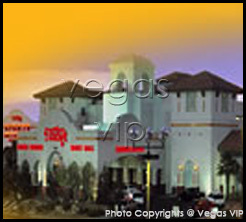 It is considered to be some of the most affordable fine dining off the strip. Garduno’s Mexican has been voted Best Mexican Restaurant of Las Vegas for the last 11 years – enough said. 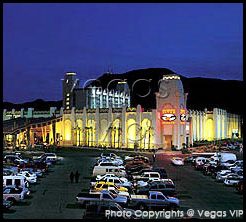 Gambling is a sure bet with Fiesta’s 50,000-square-foot casino and its 1,200 slot and video poker machines. Many guests, evidently, have been more than lucky with their Royal Flush draws!